The popular use and evidence base of yoga as an approach to enhancing mental health has increased over the past several decades in the United States.1,2 Yoga has been studied as an add-on treatment (augmentation strategy) and a stand-alone treatment (monotherapy) for depression. In the West, yoga is typically associated with physical postures and breathing, and sometimes mistaken as being only a method of physical exercise. However, yoga is an ancient mind-body practice, and in full form includes philosophical and spiritual components. The earliest documentation of yoga philosophy, the Yoga Sutras of Patanjali, outlined an eight-limb path consisting of (1) moral restraints (yamas), (2) observances (niyamas), (3) postures (asana), (4) breath regulation (pranayama), (5) turning inward (pratyahara), (6) concentration (dharana), (7) meditation (Dhyana), and (8) union of the self with the object of meditation (samadhi).3,4 The restraints (yamas) and the observances (niyamas) have therapeutic implications, as they are ethical codes of conduct with both internal (intrapersonal) and external (interpersonal) applications that could be explored with psychotherapy by a patient who is interested in the philosophical roots of yoga. The results of these recent RCTs bolster earlier reviews promoting yoga's promise for reducing depression symptoms among participants both taking and not taking antidepressant medication. However, these findings are preliminary and require replication in larger, definitive RCTs. Nevertheless, if a patient is interested in adding yoga to their treatment, there is presently enough evidence to encourage their participation. Depression often co-occurs with disorders associated with stress including anxiety, posttraumatic stress disorder, and medical conditions such as epilepsy.17 There is preliminary but mounting evidence supporting the use of yoga-based therapies as a transdiagnostic approach to target known mechanisms implicated in commonly co-occurring psychiatric and medical conditions; specifically by reducing the physiological impact of stress.17,18 The impact of stress on the body can be objectively quantified through measurements of neurotransmitter and cortisol levels, heart rate variability (HRV), and inflammatory markers. Future studies should assess the impact of yoga practice on such transdiagnostic markers to further our understanding of the mechanisms of yoga's ameliorative effects. Yoga is associated with changes in the following biologic markers consistent with stress reduction. There have been no head-to-head studies comparing different yoga styles for the treatment of depression. However, in their systematic review of RCTs, Cramer et al.25 compared different forms of yoga in their likelihood of reaching a positive outcome. They found that different yoga styles did not differ in odds of achieving a positive outcome. Given the general lack of research comparing different styles of yoga practice, the literature does not currently support any particular style of yoga for treating depression. Extrapolating from the exercise literature, however, enjoyment of physical activity has been shown to be a strong predictor of continued physical activity at 12 months of follow-up.23 Therefore, encouraging patients to explore different styles of yoga until they find a class or style that they enjoy could increase long-term maintenance of a yoga practice. An understanding and discussion of styles of yoga with your patient could be useful to set expectations and provide guidance. 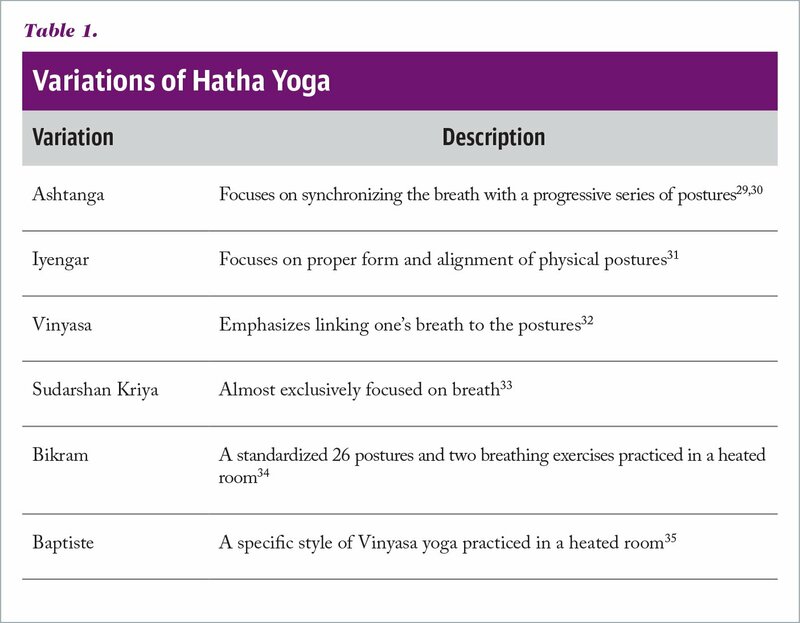 Styles of yoga vary in (1) physical intensity or rigor, (2) temperature of the room, (3) spiritual versus physical emphasis (which may have implications if patients have strong religious beliefs or philosophical leanings), and (4) focus on the breath (pranayama), the physical postures (asana), and/or meditation/mindfulness practice. Speaking with your patient to ascertain their goals and encouraging them to think through these various continuums might be useful for setting them up for success. Some styles of yoga, including Iyengar or “chair yoga,” are designed to use props, which can be particularly helpful for facilitating yoga practice among people with physical limitations or disabilities. The literature generally indicates that practicing yoga for a duration of 30 to 90 minutes, at least twice weekly, is likely to improve depressive symptoms.7,11,12 The length of tested interventions has generally ranged from 4 to 12 weeks.7 Although rigorous studies examining optimal frequency/duration of yoga practice are lacking, we can draw on the general physical activity and health behavior literature. These bodies of work would suggest that a more regular and sustained yoga practice is likely to optimize depression (and general mental health) outcomes. Basic psychoeducation is useful for informing patients that consistent and regular practice is likely necessary to achieve lasting symptom reduction. Research has confirmed the existence of the stereotype of yoga as an activity reserved for white, college-educated, younger women.24 Discussing such stereotypes may be important with some patients, as sociodemographic factors may present perceived and/or objective accessibility barriers, including but not limited to geography, (sub)cultural concerns, time commitment, family responsibilities, transportation, and cost. To address these accessibility-related barriers, researchers have begun to explore online yoga interventions as a potential way to reach rural patients and those with financial or time limitations. A recent study of 44 adults with mood disorders found that an online Hatha yoga class resulted in significantly reduced negative affect and good acceptability.26 Thus, online/remote yoga classes may be a viable alternative for patients who have barriers to attending in-person yoga classes. Guiding patients to discuss preexisting injuries with yoga teachers prior to initiating a yoga practice could be useful for those with fears of injuries or preexisting conditions. Yoga teachers are best suited to make suggestions about modifications or guidance to reduce risk for injury. The evidence base for including yoga in the treatment of depression is growing. Presently, if a patient expresses interest in engaging in yoga-based practices, there is no reason to believe that this would not be a useful add-on to conventional treatment. The current empirical literature has not explored the comparative effectiveness of different styles of yoga for depression or other mental health concerns. As such, patients should be encouraged to find a practice they enjoy. Gates R, Kenison K. Meditations from the Mat: Daily Reflections on the Path of Yoga. New York, NY: Anchor Books; 2002. Bryant EF. The Yoga Sutras of Patanjali. New York, NY: North Point Press; 2009. Uebelacker LA, Broughton MK. Yoga for depression and anxiety: a review of published research and implications for healthcare providers. R I Med J. 2016;99(3):20–22. Nyer M, Roberg R, Nauphal M, Streeter CC. Yoga as a treatment for depression. In: Shapero B, Mischoulon D, Cusin C, eds. The Massachusetts General Hospital Guide to Depression. New Treatment Insights and Options. New York, NY: Springer; 2018:223–231. Streeter CC, Gerbarg PL, Nielsen GH, Brown R, Jensen JE, Silveri MM. Effects of yoga on thalamic gamma-aminobutyric acid, mood and depression: analysis of two randomized controlled trials. J Neuropsychiatry. 2018; in press. Saper RB, Eisenberg DM, Davis RB, Culpepper L, Phillips RS. Prevalence and patterns of adult yoga use in the United States: results of a national survey. Altern Ther Health Med.2004;10(2):44–49. Uebelacker L, Dufour SC, Dinerman JG, et al. Examining the feasibility and acceptability of an online yoga class for mood disorders: a Mood Network study. J Psychiatr Pract. 2018;24(1):60–67. doi:10.1097/PRA.0000000000000286 [CrossRef]. Sweeney M. Ashtanga Yoga As It IS. 3rd ed. revised. Berkeley Vale, NSW, Australia: The Yoga Temple; 2006. Jois SKP. Yoga Mala: The Original Teachings of Ashtanga Yoga Master Sri K. Pattabhi Jois. London, UK: Macmillan; 2010. Mehta S, Mehta M, Mehta S. Yoga: The Iyengar Way. A.A. New York, NY: Knopf; 1990. Ramaswami S. The Complete Book of Vinyasa Yoga: The Authoritative Presentation-Based on 30 Years of Direct Study Under the Legendary Yoga Teacher Krishnamacha. Boston, MA: Da Capo Press; 2005. Choudhury B. Bikram Yoga: The Guru Behind Hot Yoga Shows the Way to Radiant Health and Personal Fulfillment. New York, NY: Harper Collins Publishing; 2017. Baptiste B. 40 Days to Personal Revolution: A Breakthrough Program to Radically Change Your Body and Awaken the Sacred Within Your Soul. New York, NY: Simon and Schuster; 2011. Maren Nyer, PhD, is an Assistant Professor, Department of Psychiatry, Harvard Medical School; and a Clinical Psychologist, Department of Psychiatry, Massachusetts General Hospital. Cayla M. O'Hair, BA, is a Research Coordinator, Department of Psychiatry, Massachusetts General Hospital. Lindsey B. Hopkins, PhD, is a Clinical Research Psychologist, the Addiction Research Program (jointly housed by the San Francisco VA Health Care System and the University of California-San Francisco). Regina Roberg, BA, is a Research Coordinator, Department of Psychiatry, Massachusetts General Hospital. Richard Norton, BS, is a Research Coordinator, Department of Psychiatry, Massachusetts General Hospital. Chris Streeter, MD, is an Associate Professor of Psychiatry and Neurology, Boston University School of Medicine; a Staff Psychiatrist, Boston Medical Center; a Research Associate, McLean Hospital; and a Staff Psychiatrist, Edith Nourse Rogers Veterans Memorial Hospital. Address correspondence to Maren Nyer, PhD, Depression Clinical and Research Program, Massachusetts General Hospital, One Bowdoin Square, 6th Floor, Boston, MA 02114; email: mnyer@partners.org.